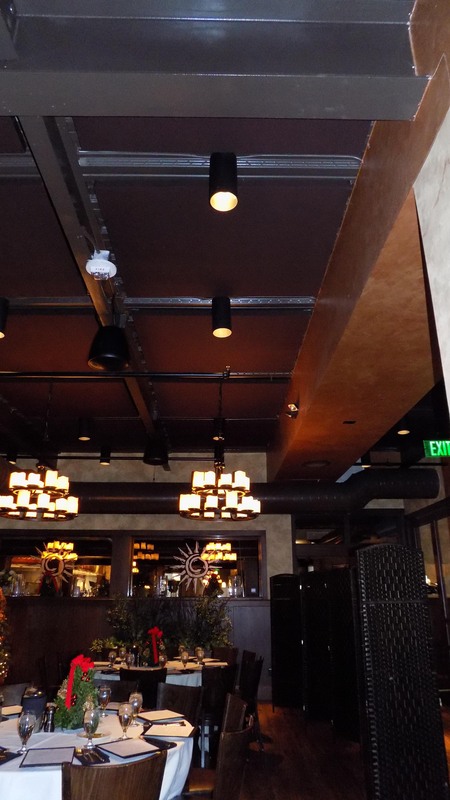 Tuscan Kitchen invites you to “enter a world of regional Italian cooking where we celebrate the culinary traditions from all over Italy.” Unfortunately, this world, while incredibly delicious, was also extremely loud, and despite the artistry infused into every delectable dish, guests were reluctant to return due to the noise. 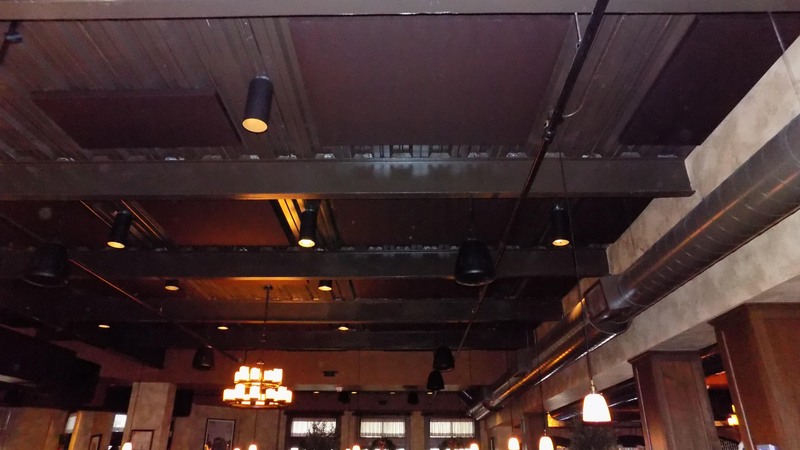 So the owners turned to New England Soundproofing for help. 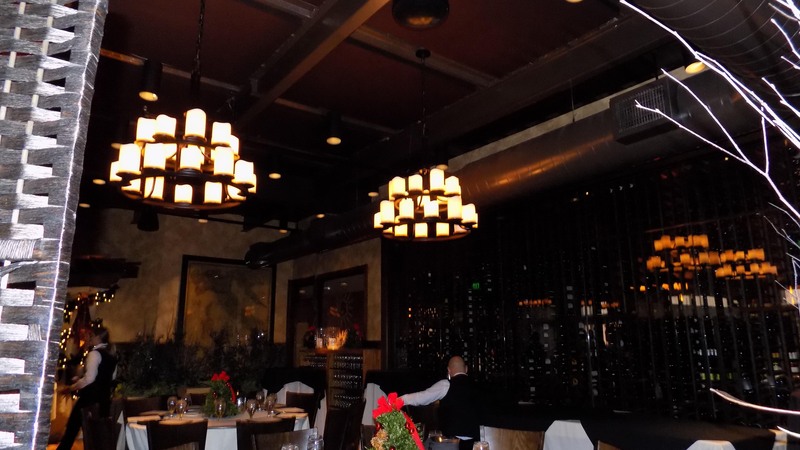 The building itself pays homage to the iconic sprawling villas found in the Tuscan countryside, complete with a stucco and stone exterior skirted by Italian Cypress trees and an interior reminiscent of a refined Italian grotto carved out of heavy stones and solid wood. 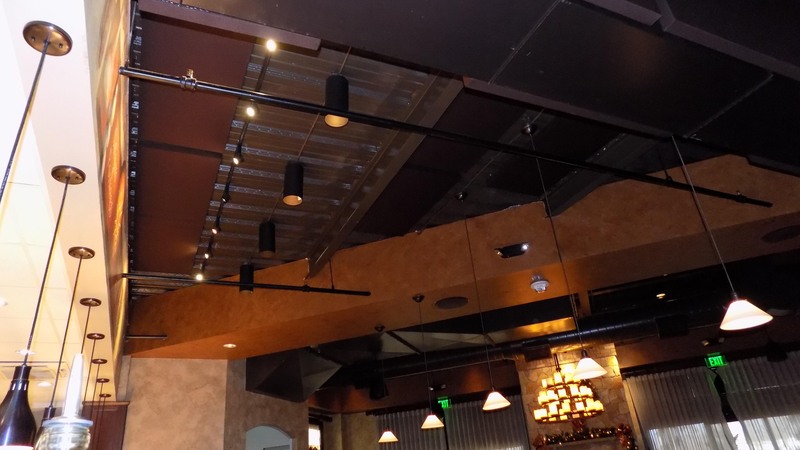 But also like the cavernous estates of the Italian vineyards, the sonorous materials and layout created a powerful echo throughout the entire venue. 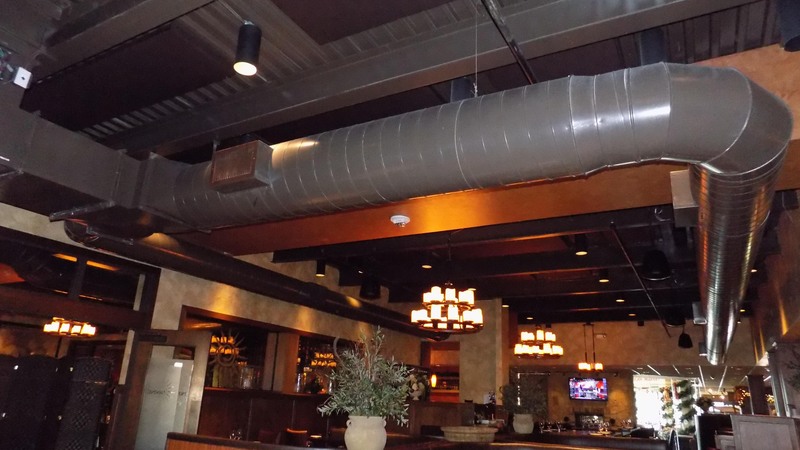 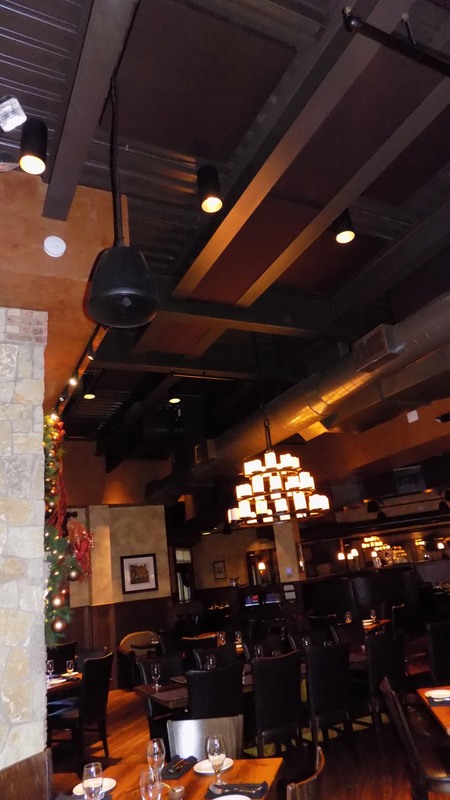 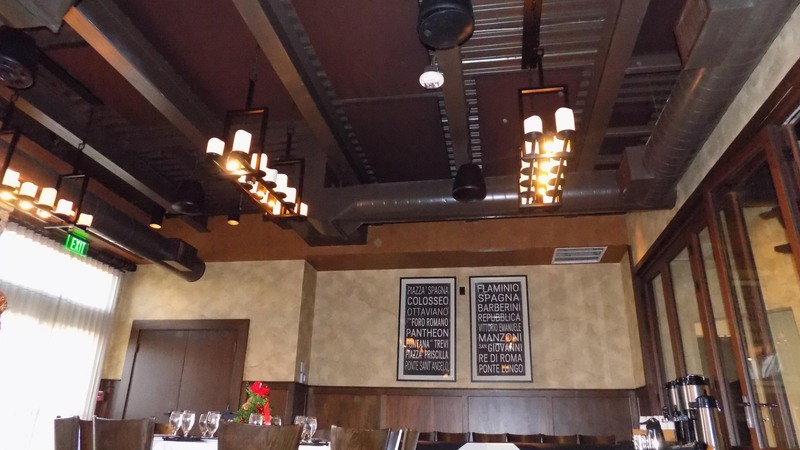 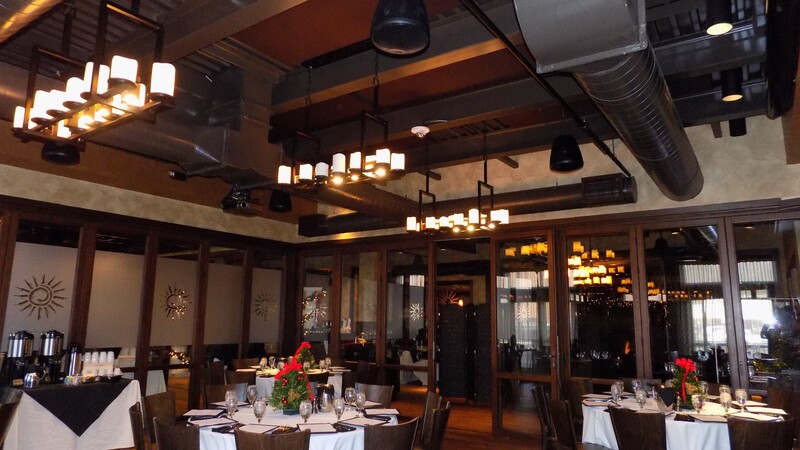 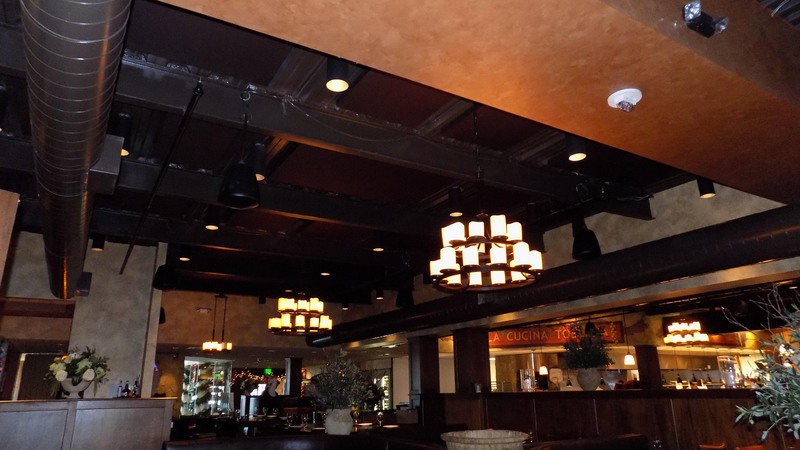 Tuscan Kitchen, which abuts its sister café and marketplace Tuscan Market, is comprised of one main dining room and bar, flanked by four private dining rooms, each with its own name and style. 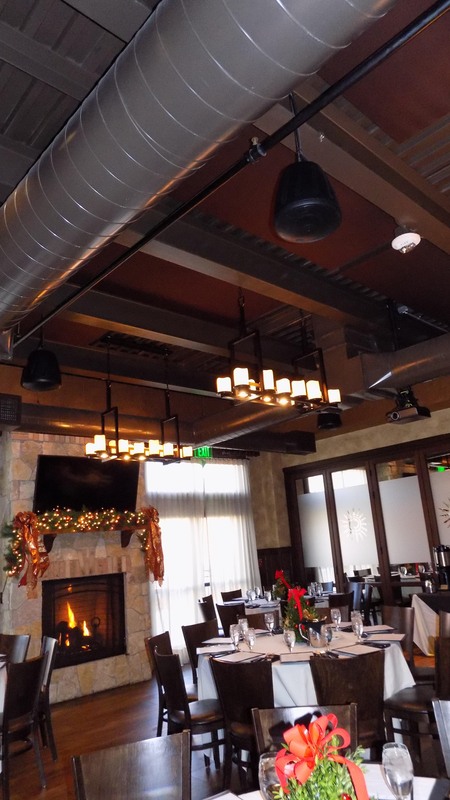 The main dining room offers an open-concept seating and bar area with a limestone fireplace, bare hardwood floors, and unadorned tables. 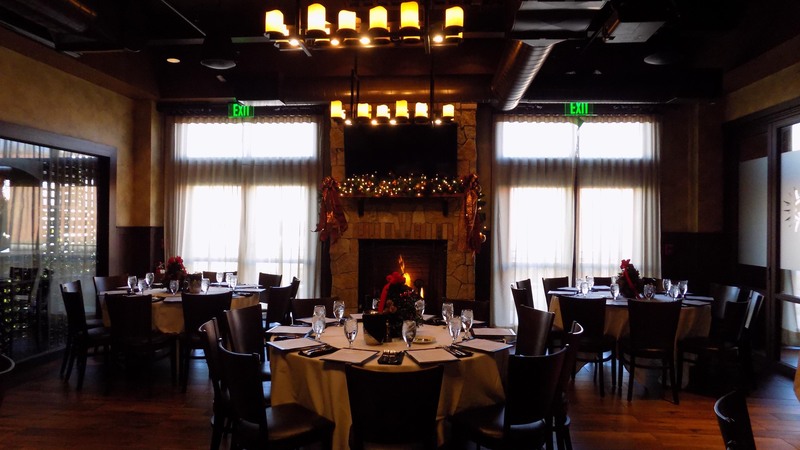 The “Wine Room” is the facility’s wine cellar, hosting stone walls and floors, stunning wrought-iron and glass doors, and oversized wooden banquet tables. 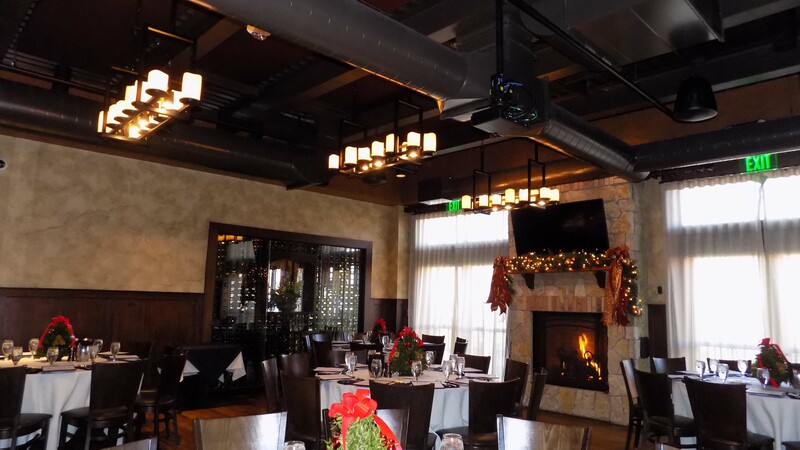 Moving into the connected private dining rooms, both “Toscana” and “Sicilia” feature their own large limestone fireplaces, glass French doors opening to the outdoor patio, and three solid walls of glass that open to the other private dining spaces. 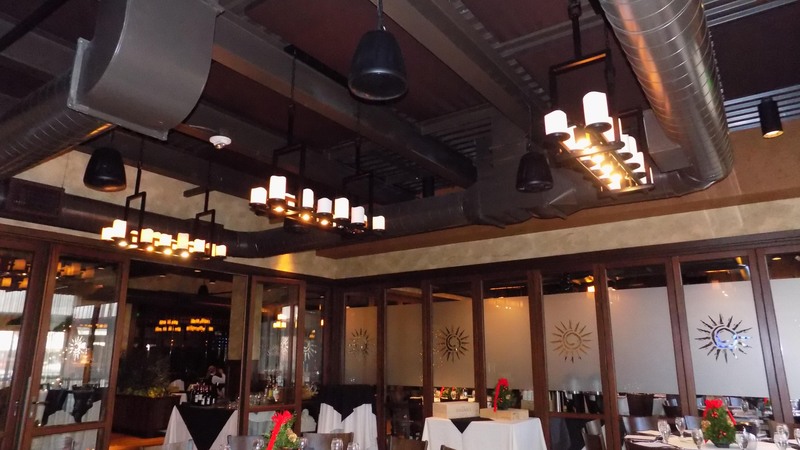 The smaller “Garden Room” is entirely encased in glass, with one wall looking into the Wine Bar’s Wine Wall. 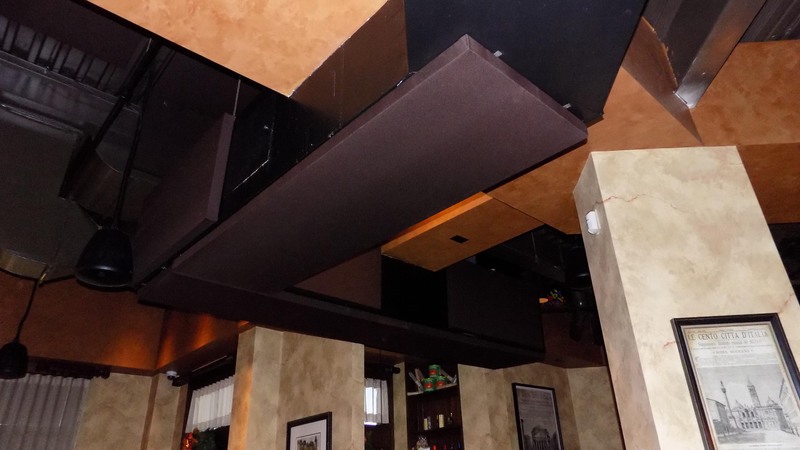 To mitigate the echo within the space, New England Soundproofing first assessed the existing reverberation time. 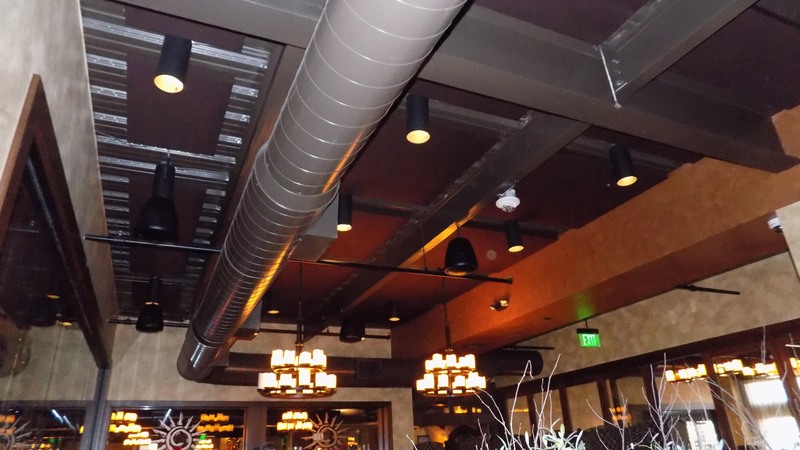 The recommended reverberation time for a dining room is approximately .6 – 1.0 seconds. 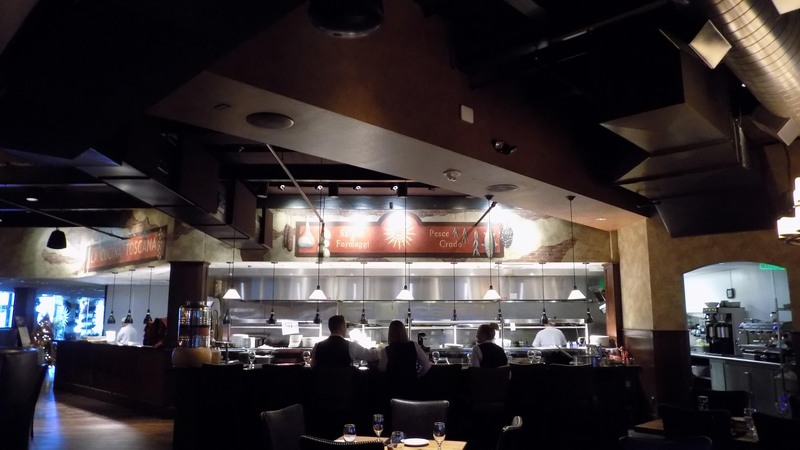 Tuscan Kitchen registered at an intense reverberation time of 4.5 – 6.0 seconds. 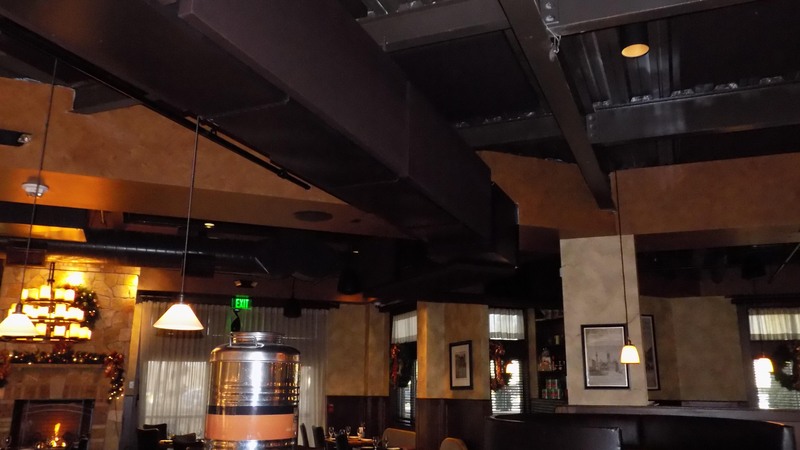 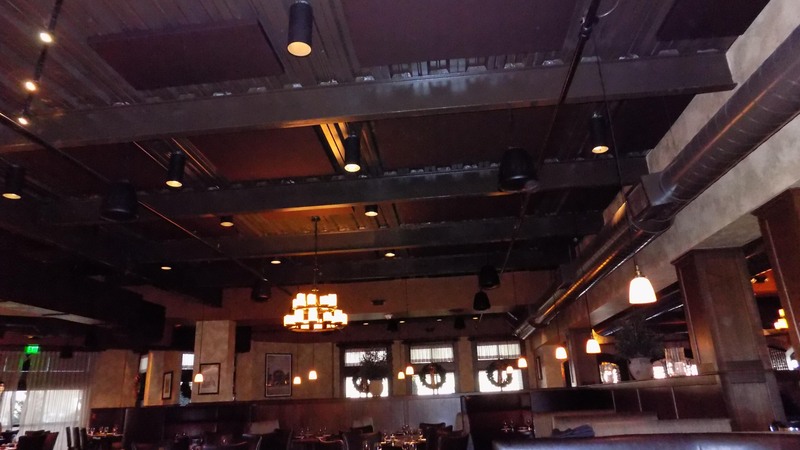 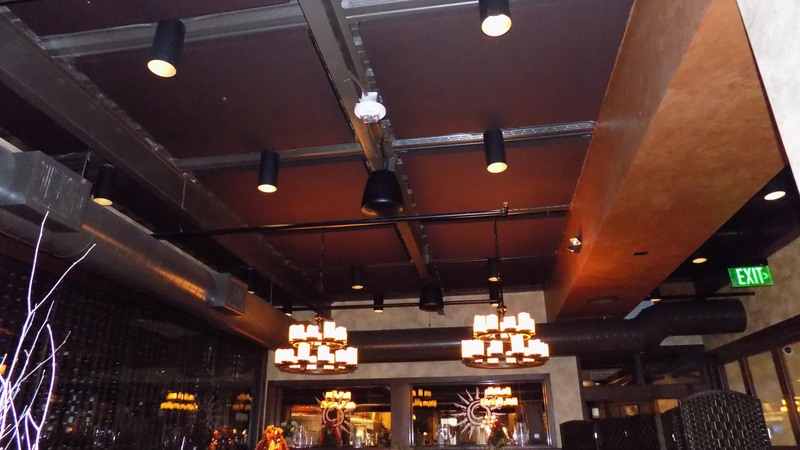 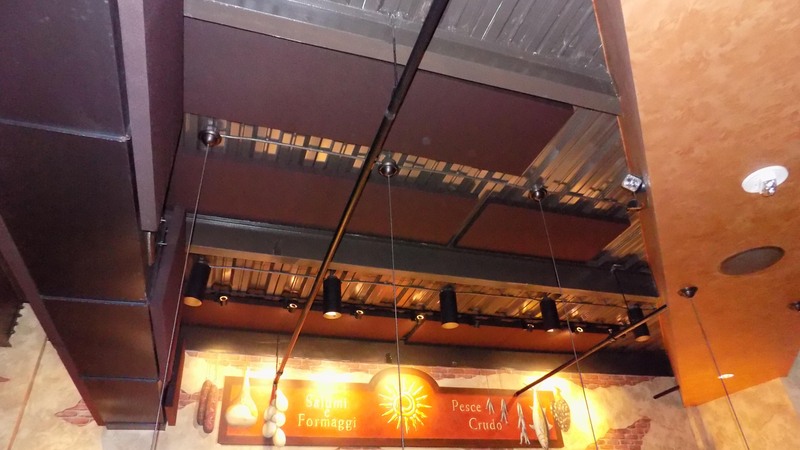 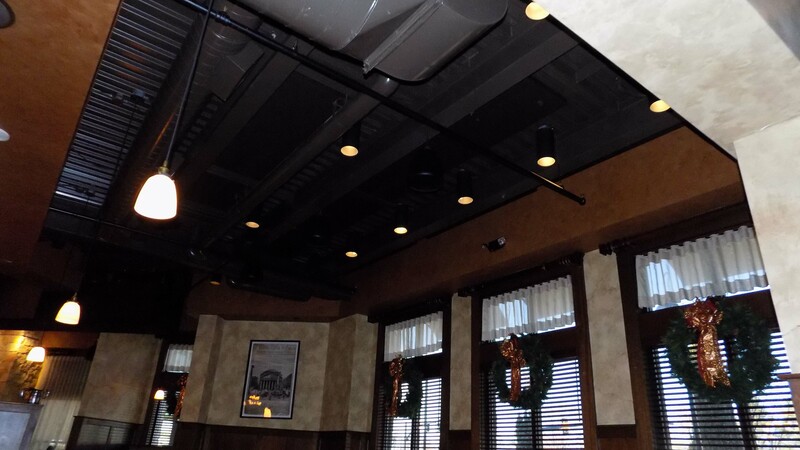 To reduce this reverberation time to a more manageable and pleasant level, New England Soundproofing installed 153 custom REVRB ™ Acoustical Panels swathed in coffee-colored fire-rated fabric to meld, unnoticed, into the décor. 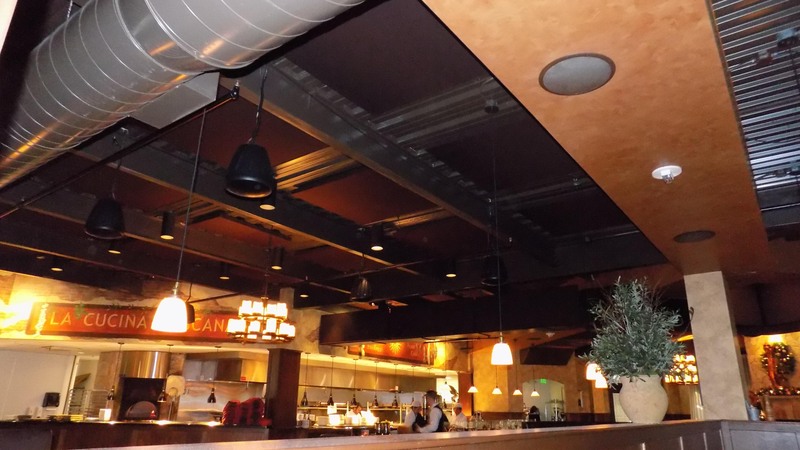 Now, Tuscan Kitchen gets to focus on providing its guests with an authentic Italian experience, but this time, without also recreating the noisy flight over.